Blog Archives - Premier Inspection Services Inc. The home inspection cost varies a great deal depending where you are located geographically within the United States so I am only going to talk about Kansas City home inspections. Even in the Kansas City Metro Areas you will find a wide array of home inspection prices. Typically as of 2017 a quality inspection performed by a full time professional home inspection company; the cost of a home inspection is $350 – $400 for a standard size home. Of course the price increases as the size of the home and amenities increase. The majority of home inspection companies charge according to the amount of square footage with certain add on fees. Premier Inspection Services found this type of fee structure to be difficult not only to ourselves but to the customer. What causes the home inspection cost to increase is basically tied to the amount of work and time involved to inspect the property and write the home inspection report. The size of the home can be determined by the amount of bathrooms, HVAC units, kitchens & fireplaces. Everyone seems to know the amount of these items when buying a home because these items are important to the buyer. Whereas the total square footage is more difficult to determine and many times is not advertised due to a fear of being sued for making an incorrect statement (This has actually happened). To me a home with large rooms really doesn’t make a difference, it is the amount of bathrooms, fireplaces, electrical panels, multiple air conditioners & kitchens that take up the majority of time and effort. Of course if the home is over 5500 square we would want to look into making a customized quote due to this may take multiple inspectors to complete the home inspection and report in a timely manner. Now that we have talked about the size of the structure let’s talk about the home inspection business. Sometimes people think wow that’s a lot of money for 3 hours of work. If that was the case that would be true but it is not the case. Kansas City home inspectors on average have to drive 45 minutes to get to the appointment which means 1.5 hours of drive time. With 3 hours of onsite time plus 1.5 hours of report writing time (if all goes well) and 1.5 hours of travel time. That means there are 6 man hours (Minimum) in one inspection. [ And if the customer orders radon testing then there is an additional 2 hours spent driving, writing and uploading that report ] That doesn’t include all of the time spent scheduling the inspection to gain access to the property and the multitude of follow up questions from either the buyer, seller, real estate agents, mortgage company needing paid invoices or contractors hired to make the repairs. Premier Inspection Services Premier Inspections, Premier Service – Guaranteed! Professional home inspectors such as Premier Inspection Services have a lot of overhead such as company vehicles, tools, computer equipment, report writing software, employees, E&O insurance, general liability insurance, workmen’s comp insurance, an actual office that answers the phone and so on… And all of this is what is needed to provide you the best service and protection you deserve. Of course you can always hire the part-time cheap home inspector that’s new to the home inspection business or the retiree that decided home inspection would be fun to do for some extra income. They don’t have hardly any expenses, insurance or the experience to provide you the professional service and protection you deserve. They definitely won’t be around if you were to have issues or questions. If they fail to identify issues correctly the cheap home inspection cost just might be the most expensive thing you ever purchased… On second thought maybe that’s not a good idea. Posted in Blog, Home Inspection TopicsLeave a Comment on How much does a Home Inspection Cost? Posted in Blog, Home Inspection TopicsLeave a Comment on What Is The Difference Between Home Inspection Organizations? Obtaining a personal reference from someone you know and trust is best. If you know and trust your real estate agent, go with their recommendation for a home inspector. If you have a great real estate agent, they’ll have a great home inspector to recommend. In order for the agent do be able to do their best job they need a good inspection and report. The inspection report is a tool that you and your agent will have to use to negotiate with. Agents know what inspectors provide them the best tool for them to be able to negotiate with. This is what they do for a living, and their job is to work in your best interest. While some home inspectors like to complain about sleazy real estate agents only recommending semi-incompetent home inspectors who won’t “kill the deal”, I’ve also heard plenty of home inspectors around the country essentially brag about what horrible customer service they give. There are good and bad folks in every industry. If your agent gives you the names of three Kansas City home inspection companies, they’re probably doing this because they don’t want you to sue them for a bad home inspection; not because all three inspectors are equal. Ask your agent, off the record, who they would use. If they say it’s a tie or they won’t commit to one, read on. * There are other online web sites that allow you to see ratings for home service providers, but the way that these service providers get work, and therefore get rated, is by paying money for every lead they get. I truly believe that the best home service providers don’t need to use these services, so are not listed in their rating system. I’m not going to say what web sites these are, so don’t ask :-). Great reviews are great, but it’s also nice to look for bad reviews. If a business gets a bad review, hopefully they respond to it. Their response will give you a lot of insight into what kind of company they really are. Also, one little trick with Yelp is to go to the bottom of a company’s review page and look up the non-recommended reviews. It seems as though about 40% of Yelp reviews show up in the non-recommended section. Once you’ve found what you feel would be a great home inspector based on online reviews, go to their web site and read a sample report. If they don’t have a sample report available, I’d seriously re-consider hiring them. Short of actually attending several home inspections, reading reports is the best way to compare different home inspectors. It’s a little bit more work to do this, but if you weren’t willing to put in a little extra time researching your home inspector, you probably wouldn’t be reading this. Photos – ” A photo is worth a thousand words” Every home inspection report should include photos. Not photos of an up close shot of wood rot for example but a photo of the affected area that is taken far enough away so that you can see exactly where the issues are that need to be addressed. The comments in the report should explain the actual issue you are looking at. Easy to read – You shouldn’t need a legend to figure out what the inspector is trying to say. Home inspection reports should be easy to understand and shouldn’t need someone with industry knowledge to interpret them. A weak inspection report might say: “Capped relief pipe needs repair”. 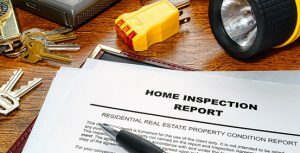 Disclaimers kept to a minimum – Many home inspection reports are filled with CYA verbiage that is focused on explaining away why the home inspector couldn’t see this or why they couldn’t inspect that. This isn’t helpful to home buyers, and when there’s too much of it, it starts to sound ‘weaselly’. Nobody wants to read through a list of stuff that wasn’t inspected although my company does provide a list of items that were not able to be inspected at the time of inspection. ( Such items could be… a garage that is so full of storage you can’t even walk in it, an electrical panel that is covered by a TV entertainment system in the basement, an attic access in the ceiling of a closet that is full of china dolls. ect. ) This list makes it easy for you and the seller to know what needs to be done to allow inspection of these items prior to purchase. A lot of Kansas City home inspectors hide the not inspected items in the report so that you the buyer don’t complain about not getting a full inspection. Realistic recommendations – This one is huge. Many home inspection reports are filled with recommendations for further testing and further inspections to the point where it gets absurd. Mold testing? Asbestos testing? Lead testing? Sewer scans? Plumbing inspections? Electrical inspections? When I see recommendations for all these other inspections, I get the feeling that the home inspector is only concerned about not getting sued; they’re not nearly as concerned about providing great service. Confidence – this one is a little harder to define, but it’s really what sets asides the rookies from the experienced home inspectors. Anyone with the most basic understanding of a house can observe an abnormality, call attention to it, and recommend a second opinion / further inspection. With knowledge and experience comes the confidence to say that something isn’t a problem. Once you’ve read through a number of online reviews and sample inspection reports, you should begin to have a clear idea of who the right inspection company will be. You’ll probably have to spend more money to hire this company, but you won’t regret it.